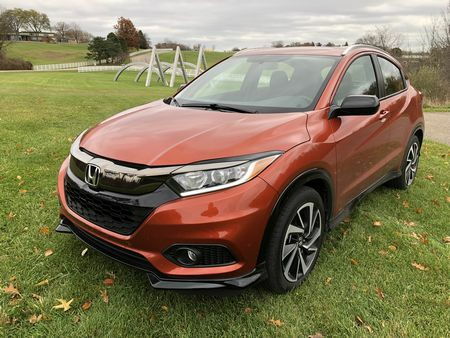 With 2019 marking the fourth model year of Honda's subcompact HR-V crossover, the lineup undergoes a number of changes, not the least of which are two new trim levels. The Sport trim, slotted between the LX and EX trims, adds a gloss black finish to the outside mirrors that matches the lower side sills. Standard roof rails, a bright chrome exhaust tip and fog lights complete the exterior changes. 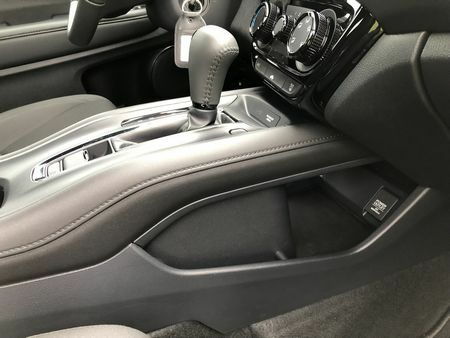 Interior enhancements include a leather-wrapped steering wheel and shift knob, metal sport pedals, a 180-watt, 6-speaker audio system, a 7-inch touchscreen display with SMS text message, Apple CarPlay, and Android Auto functionality, a gear selection indicator, and Homelink capability. The Touring trim is the new range-topper, eclipsing the EX-L with standard all-wheel-drive, alloy wheels with a machine finish, LED fog lights, LED headlights with auto on/off, body-color lower side sills, a sophisticated Homelink remote system, and satellite-linked navigation with voice recognition, HD digital traffic, and turn-by-turn directions. Outside, the HR-V shares a number of styling cues with its larger brother, the CR-V. The 2019 version benefits from a mild freshening with revised bumpers a more aggressive grille and lower air intake, and narrower headlamp enclosures. In back, a narrow chrome strip now spans the gap between taillights that feature new LED brake lights, while the lower valance has been re-shaped with more sculpting. There's some nice body sculpting along the sides with the vertical surfaces made more interesting with a rising upper character line and lower horizontal character line. Only the front door handles are visible – those in back are cleverly hidden in the C-pillar. 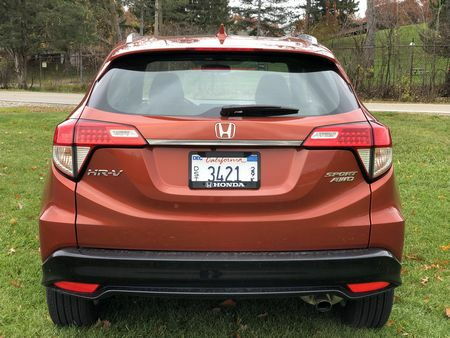 To us, the HR-V, especially in Sport trim like our tester, is easier on the eye than the CR-V, with the large rear spoiler complementing the swept-back roofline, as well as the more conventional horizontal taillights, versus the CR-V's vertical units. 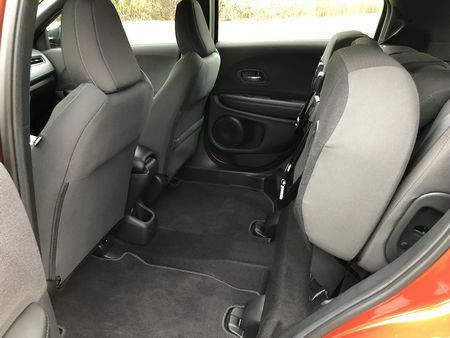 Moving inside, the HR-V gains style points with a cabin that's both functional and stylish. Although you can tell there's been some cost cutting, most of it takes place well below the driver's view. 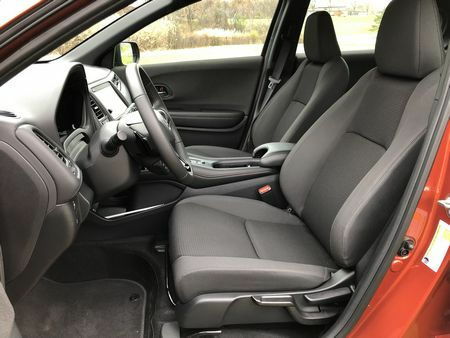 There are plenty of soft-touch materials throughout the cabin and everything fits together nicely, giving the HR-V a more upscale feel than its moderate price tag may indicate. The sliding center console features a soft armrest with a small storage bin. Forward of that is the electronic parking brake with a brake hold button. The lower front portion of the console is open and contains a 12-volt power outlet, 2 USB ports and 1 HDMI port. The backlit gauge cluster (tach to the left, speedometer center, info and gas gauge on the right) is clear and easy to read, the buttons and knobs are silky smooth, intuitive and within easy reach of the driver, while the speedo features an illuminated ring that morphs from white to green depending on the current state of fuel efficiency. 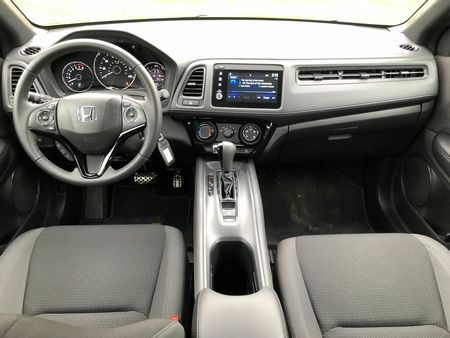 Responding to criticism dating back to the crossover's first model year, Honda has added a real on/off volume button to the in-dash infotainment screen, while simultaneously eighty-sixing the CD player. 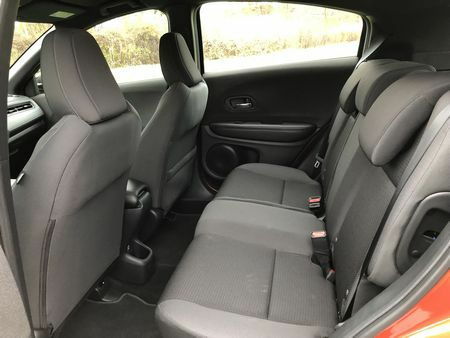 Comfort is another high point, especially for front seat occupants, with firm, inviting seats that are nicely bolstered, placing the HR-V ahead of most competitors. 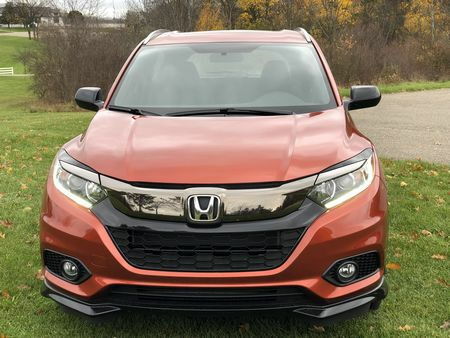 The highlight, of course, lies just behind the front row – the area that serves as an exclamation point to the HR-V's roominess and incredible versatility. Borrowing a page from the Fit's playbook, the back "magic seat" lower cushions individually flip up and can be locked in the vertical position to carry tall items (large boxes like a big screen television or, in one case, an antique chair placed upright behind the driver's seat) – something no other vehicle in this class can do. With the back seats in their normal position passengers are treated to 39.3 inches of leg room. 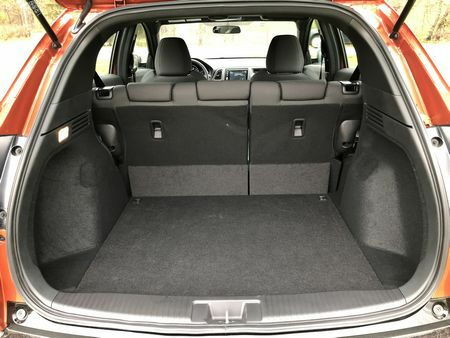 Not stopping there, cargo volume behind the back seat ranges from 23.2 cu ft on AWD models to 24.3 cu ft on those with 2WD. 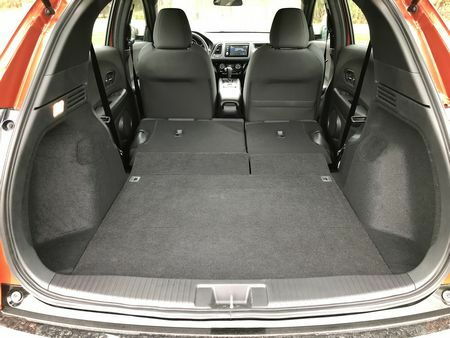 Flip the back seats forward – they fold completely flat – exposes 57.6 cu ft of cargo space on AWD models or 58.8 cu ft with 2WD – enough to carry a 52cm road bike without removing the wheels, and making the HR-V the most cargo-friendly vehicle in its class. 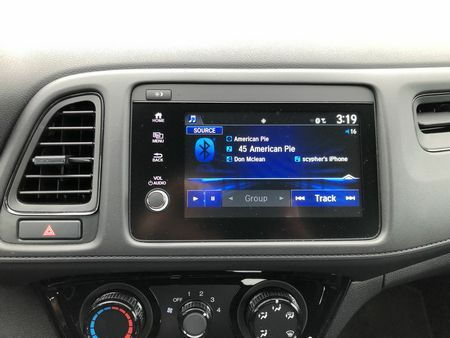 At the same time, despite great strides with the infotainment interface, work still needs to be done. Setting station presets required us to consult the owner’s manual. 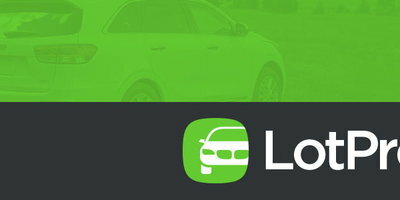 It’s not at all intuitive, and although owners admittedly will probably do it just once (unless, of course, the battery is disconnected), performing what should be a simple task can be time consuming – it shouldn't be this difficult. 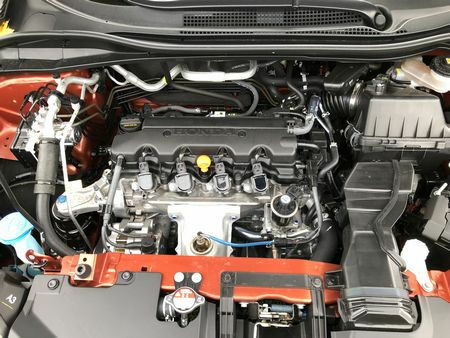 The HRV's one and only engine is a direct-injected 1.8-liter DOHC four-cylinder producing 141 horsepower at 6500 rpm and 127 lb-ft of torque at 4300 rpm. This engine is paired to a continuously variable transmission (CVT). Dual-mode, steering wheel-mounted paddle shifters are standard on all but the LX trim. Front-wheel-drive models score an EPA-estimated 28 miles per gallon in the city, 34 on the highway, and 30 combined, while all-wheel-drive models are rated at an EPA-estimated 27 miles per gallon city, 42 highway, and 31 combined. Matching up nicely with the refined-for-2019 CVT, the 1.8-liter four-cylinder engine offers smooth, seamless acceleration around town. Quick, responsive steering makes zipping in and out of city traffic a breeze, further upping the in-town driving experience. Considering the HR-Vs size, comfort is also surprisingly high, with the compliant suspension – MacPherson struts up front, torsion beam in back on 2WD models and a more sophisticated DeDion setup on AWD models - handling everything from small road imperfections to large potholes with ease. 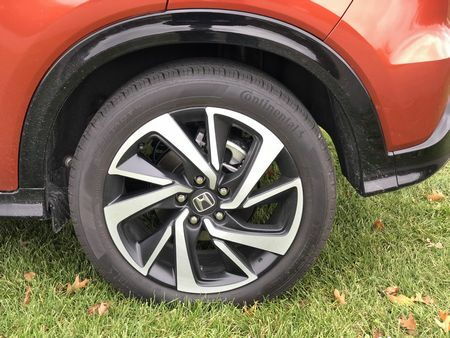 We found this to be true even when equipped with the larger 18-inch wheels found on Sport trims like our tester, while models with smaller 17-inch wheels and tires with taller sidewalls should fare even better. The HR-V also handles curvy back roads better than most in this class, although it's not as entertaining as Mazda's CX-3. Feedback through the electrically-assisted power steering is better than average and, although there isn't much of an initial bite to the brake pads, stops are sure, the brakes are easy to modulate and there's plenty of feedback through the pedal. Another upside is the fact that all-wheel drive is available on all models and standard on the Touring trim, which doesn't force buyers living in colder states, who need more traction, into more expensive trim levels just to get it. Interior sound levels around town are very good and the cabin is also fairly quiet on the freeway - provided the pavement is smooth. But at higher speeds, rough road surfaces and expansion joints can cause tire slap noise to enter the cabin. The HR-V is also slow in anything other than normal city jaunts. Even though Honda has done a yeoman's work in perfecting the HR-V's CVT transmission - eliminating most of the "rubber band" effect of earlier units - hard acceleration still results in engine drone. In addition, models with front-drive models have more ground clearance than those with all-wheel-drive. Finally, the HR-V's average-at-best fuel economy - an EPA-estimated 28 miles per gallon city, 34 mpg highway, and 30 combined with front-wheel drive and 26 mpg city, 31 highway, and 28 combined on all-wheel drive models - offers no trade-off as its sluggish performance lags a number of more fun-to-drive competitors. 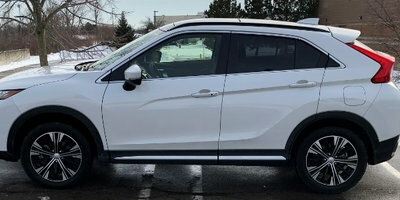 2019 HR-V fixed-equipment-model-level pricing start at $21,515 for a front-wheel-drive LX, and tops out at $29,535 for the new all-wheel-drive Touring model. In addition to the usual power features, standard equipment on the base FWD LX includes a CVT automatic, LED daytime running lights and brake lights, a rearview camera, auto-off projector beam headlights, remote entry, LED interior pocket light, 5-inch color LCD screen, a 160-watt, 4-speaker audio system, Bluetooth phone and streaming audio, and 1 front USB port. 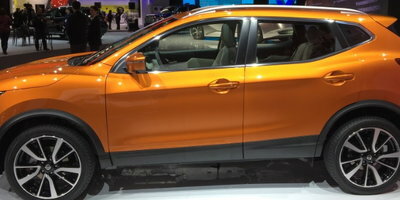 The Honda Sensing suite of advanced safety features that includes a rear view camera with dynamic guidelines, forward collision warning, lane departure warning, automatic emergency braking, road departure mitigation, lane keep assist, and adaptive cruise control as well as Honda LaneWatch are standard on EX, EX-L, and Touring models, but unavailable on either the LX or Sport trims. Our Crystal Black Pearl Sport AWD tester had a base price of $23,620. A destination fee of $995 brought its MSRP to $24,615. 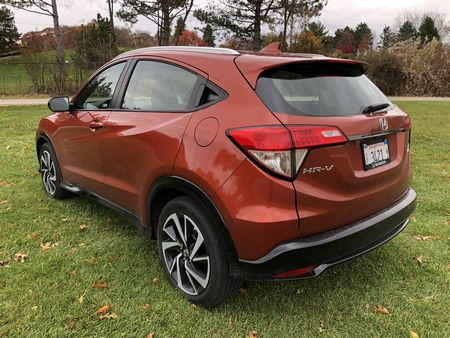 After driving the new Sport model for a week, we've come to the conclusion that, despite a number of flaws – including slow acceleration, the eighty-sixing of the manual transmission, and the lack of advanced safety features on the two most affordable trims - the 2019 Honda HR-V remains one of the better small crossover offerings, excelling in both cargo and people hauling, where it's at the top of the class.